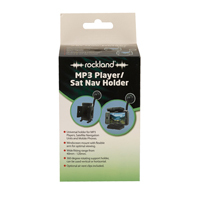 Sat nav accessories is an umbrella term that’s used to describe everything from 12V chargers to carry cases. Invest in the right kit for job and explore the range available at Euro Car Parts below. When it comes to getting from A to B in the quickest, most fuss-free way possible, nothing beats a satellite navigation system. Whether yours is built into your vehicle's central control unit, or purchased as a separate accessory that plugs into your 12V socket, sat navs have been making their way into the mainstream for years. Don’t get left behind and keep your sat nav running as it should and invest in a new set of sat nav accessories with Euro Car Parts. Across the range you’ll find plenty of accessories to choose from, all from reputable, household brands that won’t let you down. Free UK delivery is available across the range, while click and collect allows you to pick up your new sat nav accessories in one of over 200 stores nationwide once they’ve been reserved online. Should you have any questions, don’t hesitate to give us a call on 0203 788 7842.